A complete guide to teaching guided reading in elementary / primary classrooms for teachers and students. Few skills can benefit a child more throughout their life than the ability to read. It is a skill of such singular importance that it plays a role in most aspects of everyday classroom learning. However, unfortunately for a skill of such importance, it isn’t always possible to find the time for 1:1 reading with every student every day during the busy school schedule. It is this problem that guided reading is designed to address. Guided reading is a group method of teaching reading skills that can be used in place of, though usually in addition to, occasional 1:1 reading and discrete phonics instruction. Generally speaking, guided reading involves teaching groups of children according to their ability levels. The exact number in each group will depend on the number of children in the class, as well as how well they do in a baseline reading assessment. Usually there are about five groups in the average class, though these groups may be uneven in size and can be updated at various intervals throughout the year according to individual rates of progress as reflected in reading assessments. 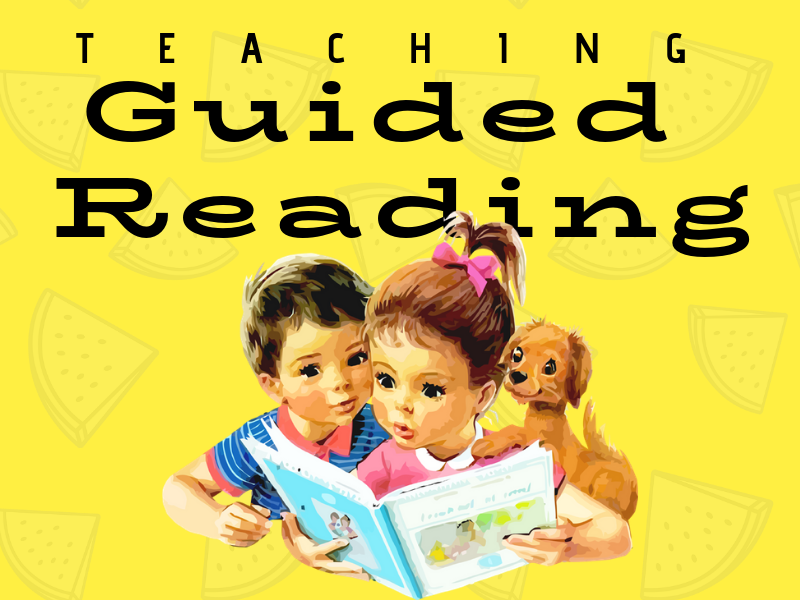 In essence, guided reading is all about teaching to the various needs of the leveled groups in the classroom. It endeavors to instruct the students in a range of reading strategies that can be later applied independently to any new book the student encounters. How is Guided Reading Organized? To implement guided reading successfully, multiple copies of graded readers will be needed. You will also need to assess each student’s reading abilities to enable you to group them according to their specific ability. For our elementary-aged (or primary-aged) students, reading should be a daily activity. Given the size of the average class, guided reading is often the main method employed to teach reading. If there are five guided reading ability groups in the classroom, the teacher can expect to read with each group approximately every other day, for a minimum of twice per week. This is usually done on a rota basis. While the teacher reads with a group, the other groups can be engaged in other reading activities suitable for their level. These activities may include phonics work, sequencing activities, comprehension tasks, language games etc. If there is a teaching assistant in the classroom, they can either support the children in completing these supplementary activities, or take the lead in a guided reading session also. Implementing guided reading successfully in the classroom requires considerable organisation. To make the most of the allotted time in the classroom it can be very helpful to dedicate a specific area to the practice. As we have stated in the introduction, the main aim of guided reading is to instruct the students in the use of reading strategies that will eventually enable them to confidently and competently read any book by themselves. Prediction - What do you think will happen next? Clarification & Questioning - Which parts of book did you find difficult? What questions do you have about these? Summarizing - What is this book about? What happens? Prediction encourages students to draw on their own prior learning and experiences to allow them to make educated guesses on what may follow in the story. Prediction activities are great activities to hone your students’ predictive abilities and comprehension skills, and they can be repeated often. They also have the added advantage of requiring very little preparation by the teacher. Prior to beginning to read the chosen book, some pre-reading work is necessary to focus the students’ minds on the task at hand. ● Title - What is the title of the book? What does the title reveal about the book? ● Blurb - What information does the blurb reveal? What expectations does it create? ● Author - Who is the author? What is the author’s purpose in writing this book? ● Illustrator - Who is the illustrator? What clues do the illustrations give you about this text? ● Cover - What does the cover make you think about? What expectations are created? ● Genre - What type of text is this? Is it fiction or nonfiction? How do you know? What are our expectations of this genre in terms of subject and format? While prediction begins with the mostly pre-reading activities outlined above, there will be ample opportunities for the student reader to make further predictions throughout the reading of the book too. For example, it is good practice to ask the students, or encourage them to ask themselves, prediction type questions at the end of a paragraph, section, or chapter. Working on using prediction strategies in guided reading encourages the student to read closely for inferences and other clues that will indicate the journey the text may take. It also encourages the student to pay close attention to the content of the text as they read. This kind of holistic approach to reading improves overall comprehension of a text. Provide the students with a T-Chart worksheet entitled ‘My Predictions’. The chart should consist of two columns; one headed My Prediction and the other Why I Think This. Provide a space to record the student’s name and the title of the text at the top of the sheet. At any point during the reading of the text, you can instruct the students to stop and think about where this story is going. Students can record their predictions on their sheet, as well as the reasons for thinking this. This activity can serve well as a supplementary reading activity on days when the group is not scheduled to read with the class teacher. In terms of guided reading, clarification refers to first identifying the difficult parts of the text, before making sense of them through a variety of clarification techniques. These techniques can be as simple as looking up a word in a dictionary. There are other tools available to students, however. Often, when students look up the meaning of a word in a dictionary it helps clarify the meaning of that part of the text in the short term, but sometimes the word’s definition is not retained for the next time the student comes across it. Sometimes it is better for the student to use other techniques to work out the meaning, such as employing contextual clues. Drills employing sentence starters are a great way to effectively train our students to clarify and question and to help internalise these strategies. Begin with the clarification prompts to help students identify the areas of the text they are unsure of, before moving to the question prompts to help them begin to work out the meaning and significance within the text. These prompts help students to identify more closely the source of their confusion when reading a text, and to learn to ask for assistance. In the process of receiving an answer to their questions, they begin to broaden their understanding of a range of techniques they can later employ in independent reading to clarify the meaning of a text for themselves. In the context of guided reading, it can be helpful for students to work together to form the questions to ask their teacher. Rather than directly answering the questions for the group, however, teachers would do well to encourage the students to work towards finding the answers for themselves, as this not only helps knowledge retention, but improves their reading independence. Summarizing is an important skill for students to develop. It helps students to identify the most important parts of a text or story and to learn to ignore irrelevant details and information too. Students who practice summarizing learn to integrate the details and the main ideas of a text in a meaningful way. Summarization is useful for fiction and nonfiction genres alike. A simple way to encourage your students to summarize a story is to ask them to paraphrase it in their own words. As it will be highly unlikely they will have memorized the entire story word for word, paraphrasing the story will allow you to assess their overall understanding of what they have read. ● What are the main ideas in the piece? ● What are the most important details or points made? ● What details or information is irrelevant or unnecessary? ● What are the keywords and phrases in the text? If they have photocopies of the story, you may wish to have them underline or highlight the information related to the above questions in different colors and then ask them to retell the story in their own words after they have done this. Encourage them to use the keywords and phrases used in the text in their retelling too. To get guided reading started in the classroom requires lots of planning and organisation at the beginning of the year, but this initial investment of time and effort reaps rich rewards for students that is reflected in their rapid progress. Once clear procedures and routines are established, your students will become more adept at applying the broad range of strategies to a wide range of text types. This will go a long way to producing the confident and capable readers any teacher would be proud of. Now, get guiding!